St. Vincent is the largest island in this small Caribbean country, with a population of 110,000. 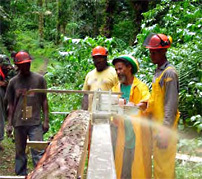 The Ministry was looking for the best way to mill thinnings from older Caribbean pine plantations, and from nonnative hardwood species such as Blue Mahoe. 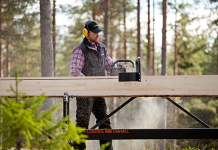 They recently purchased a portable sawmill model M7 and training. 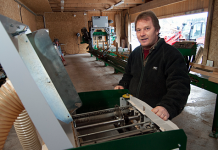 The first day was devoted to putting the sawmill together and then putting on a demonstration and press conference. The press conference was scheduled at 2 in the afternoon and the Head of the Ministry of Agriculture would be there! The mill hadn’t been assembled yet, so the pressure was on. I had about 25 people helping me put together the sawmill, and their enthusiasm for the project was inspiring. We had several groups working together under the shade of an almond tree, and before long the M7 began to take shape(albeit, we did put it together 2 or 3 times before it was the right shape). We got a log on the mill and began our first cut right when the TV cameras showed up and the Head of the Ministry of Agriculture, Forestry, and Fisheries was ready to start the press conference. We had a quick press conference during which the Minister expressed his optimism for the project and told of other projects in the Grenadines that he thought the Logosol sawmill would be helpful for. After that, we made a demonstration cut with the cameras rolling and the sawdust flying. I gave a few interviews with the local TV stations and then we finished off the logs and got ready for the next day. The second day, we positioned the M7 in the back of a 4 wheel drive diesel Toyota pickup and headed up into the edge of the rainforest. The Ministry had some 40 year old Caribbean pine plantations that they were interested in thinning, and we would be making some test cuts in one of their plantations. About 4 or 5 vehicles went up there, with me in the pickup with Franklin, who was the best driver in all of St. Vincent. Negotiating the traffic in St. Vincent was an everyday adventure, and Franklin was the best at this, thankfully for me. As soon as we arrived, the rain started, but that didn’t slow us down. We set up the M7 in the rain, and they dropped a pine tree and pulled the log out of the forest and onto the mill. 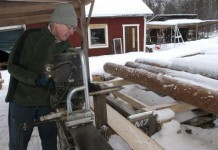 Once we got the log situated, we began to make some nice cuts on the mill, with everyone there taking a turn. We got in some good training that day, in spite of the rain. The mill proved it could handle the Caribbean pine easily. At the end of the day, we loaded the mill, lumber, and people in the back of the trucks and went back down the mountain. The big test for the sawmill would be the next day, when we went up to the edge of the rainforest to mill some Blue Mahoe. Blue Mahoe is a non-native hardwood that has found a home in St. Vincent. 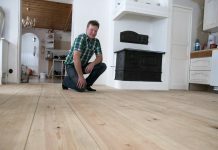 It is a very desirable hardwood, with beautiful grain patterns and a variety of coloration within the wood. It will range from reddish to bluish coloration to white within the same log. It makes for some very interesting furniture. 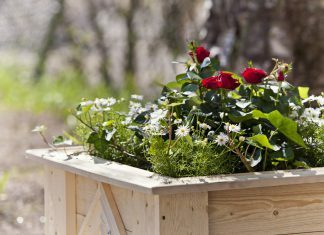 The Ministry is interested in harvesting this species and making the wood available to local craftsmen to use in furniture production. Blue Mahoe is very hard, and grows to impressive sizes quickly in this environment. The log we had waiting for us about a half mile into the rainforest was around 30 inches in diameter. Officials with the Ministry expressed their doubts as to whether the sawmill could successfully mill this species. We toted the sawmill and equipment in to the site, which was completely inaccessible by mechanized machinery. 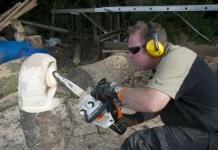 We selected a log and began to take it apart using the M7 sawmill. The employees of the Ministry were impressed and again everyone there got a chance to cut a board. The lumber in the Blue Mahoe log was beautiful and board after board began to stack up as the day went on. 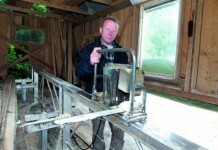 We also had local craftsmen there to see the milling and they also got a chance to try out the Logosol sawmill. At the end of the day, everyone carried out a plank. St. Vincent is absolutely beautiful. During our breaks back at the trailhead, we were able to see native St. Vincent Parrots flying above the trees of the mountainside. The rainforest was very impressive, with many unique species. It was a joy to work with the employees of the Ministry of Agriculture, Forestry and Fisheries in St. Vincent. The employees and local craftsmen were very enthusiastic and eager to learn. I was very impressed with their love of their resources and their ongoing efforts to maintain it. I am hoping the M7 will become an integral part of their operations.